Come show off your creative side and help Project Bread make this year's Walk for Hunger a success! Volunteers are needed to help paint signs to line the Walk for Hunger's 20-mile route. These signs are crucial to making the Walk a safe and successful event. Last year, the Walk for Hunger had 42,000 participants and raised $3.6 million. With demand for food in Massachusetts at an all-time high, our community needs your support! Please wear clothes that you don't mind getting a little paint on. Ages: Children under 16 years old must be accompanied by an adult. The Cambridge Winter Farmers Market provides healthy, fresh foods to residents of Cambridge and the surrounding area, including those using SNAP benefits. It's a great place to taste and buy a great variety of foods grown and made in New England: fruits, vegetables, meat, fish, cheese, breads, preserves and more. We're supporting the local economy and agricultural land use in New England. There are two-dozen vendors, live music, and fun community events that run alongside the market every week. Volunteers help vendors bring in/out big crates of apples or vegetables. Furniture needs to be set up for the community events and seating area, and some other basics that make the market happen. This volunteer opportunity requires moderate physical labor. For your elderly neighbors, even a small amount of snow and ice can increase isolation and the risk of falls. Your help is needed to keep your neighbors safe! Volunteers check in on their elderly neighbors when the snow falls. By clearing your neighbors' steps, sidewalks, and driveways you will truly be a hero by keeping them safe and connected to their community. Volunteers are matched with a specific elderly neighbor, and commit to shoveling for them each time it snows. Each time there is any amount of snow accumulation Angels are asked to drive by the home(s) of the senior(s) they are assigned to and take care of any necessary snow removal. Angels are asked to shovel as soon as possible after the snow stops and within 24 hours. How does the Ethos Snow Angels program work? Share a picture on Facebook or Twitter of you, your family, and your friends shoveling for an elderly neighbor using #ethossnowangels. They'll send you a free Ethos Snow Angel hat, invite you to an end of the season party, and enter you into a raffle to win Red Sox tickets and other great prizes. Each time you shovel, you'll be entered into the raffle - the more you help your elderly neighbors the more chances you have to win. Know that you have helped some of the most vulnerable among us and that you are a hero in the neighborhood! Be the most popular person on the construction site! Join with your family or friends to make lunch for one of Habitat for Humanity's corporate volunteer teams. They'll really appreciate it and you'll be making a valuable contribution toward building or renovating a home in partnership with a family in need. Create a simple lunch (e.g. sandwich, chips, fruit, dessert) for up to 12 people and deliver to construction site. You can build your child's empathy muscles and donate to a great cause at the same time. Get your family involved in this year's drive by collecting new, unused pajamas for underprivileged children statewide. Kids of all ages love pajamas. Children also love choosing pajamas for other children. Buy a few (or many) new pajamas to donate to deserving children. Want to make an even bigger impact? You can still host a Pajama Drive at your home, school, or organization. Last year's drive supplied Cradles to Crayons with thousands of new pajamas that kept local kids safe and warm throughout the year. Your participation will help them fill this need again. There are many ways to volunteer with your children at home. One way is by donating your used books. This is a great way to clean out your bookcases and help your children build generosity and a sense of giving to others. With multiple organizations accepting books, this can be a fun and easy project for your family. Boomerangs (Aids Action Committee), 716 Centre Street, Jamaica Plain. Drop-off hours are Monday-Saturday, 11-6, Sun 12-5. Women's Lunch Place, 67 Newbury Street, Boston. Donations are accepted Monday-Saturday from 9-11am. Many seniors in our community face loneliness every day. You and your family can share the kindness of a personal connection with an older adult. When your family visits a senior you help your children become comfortable with our aging population and bring cheer to those who are isolated and lonely. Regular visits with a senior can help enhance the lives of both the senior you visit and your family. Many programs provide training and ongoing support for volunteers; some will ask for a minimum time commitment, typically at least six months. 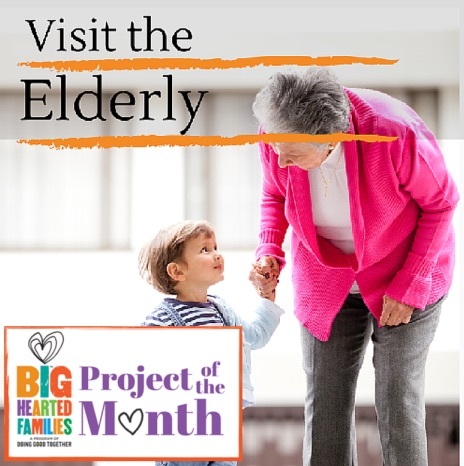 Doing Good Together's Visit the Elderly project page offers lots of suggestions for visiting with seniors, reflection questions for your family, and additional resources. You can contact a local nursing home or care facility or an organization in the Boston area that offer senior visiting programs like Little Brothers-Friends of the Elderly or Friendship Works. You can also search for nursing homes in your area on the Massachusetts Senior Care Association website.